All of us are now living in the sort of world Orwell probably envisioned where a president of the United States could point to clear evidence of “Global Warming” (Climate Change) and still convince his near fundamentalist cult-like following that what they are seeing is, in fact, proof that “Global Warming” doesn’t actually exist. Then the next day he’ll take credit for re-subsidising an ancient and polluting industry like coal mining (“beautiful clean coal,” anyone?) while breaking the global Paris agreement on Climate Change. Unsurprisingly, the dismantling of environmental regulations designed to protect ordinary people from the amoral effects of the company profit motive came soon after. It’s not a situation particular to the US either. As more and more authoritarian right-wing regimes modelled on Trump’s success takes root around the world fewer and fewer formal legislative priorities will have climate action at their core. So it will be increasingly up to us, the private citizens and companies, to fill the leadership void left behind in the world. 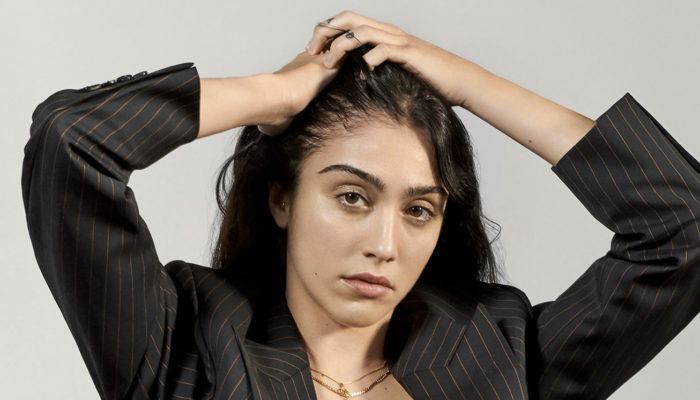 After years of being slow on the uptake the past decade has seen a fundamental shift in attitude in the fashion industry. 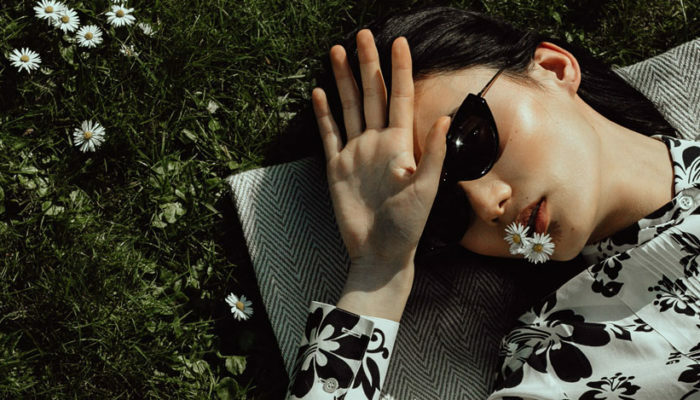 Fashion is now one of the loudest voices in the world advocating for sustainable business practices as standard. As befits the punk who once appeared on a 1989 cover of Tatler dressed as Margaret Thatcher, Vivienne Westwood is clearly not the type to be afraid of going against the grain. One of the freedoms of being a privately owned business is the ability to march to the beat of your own drum without having to concern yourself with shareholders and the size of their dividends. 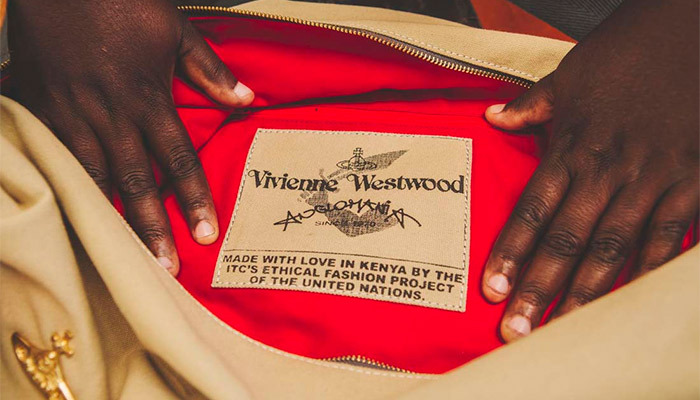 For example, since 2010 Westwood has been part of the Ethical Fashion Initiative (EFI) started by former Italian fashion executive turned UN officer, Simone Cipriani. The EFI is a joint program between the UN and the World Trade Organisation. 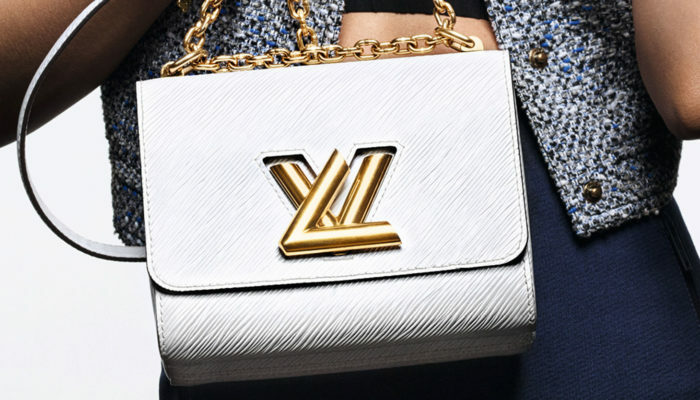 Seeing luxury fashion as a path to development, the initiative set itself up to be the broker between thousands of skilled micro-producers in the developing world and the wider global fashion industry. 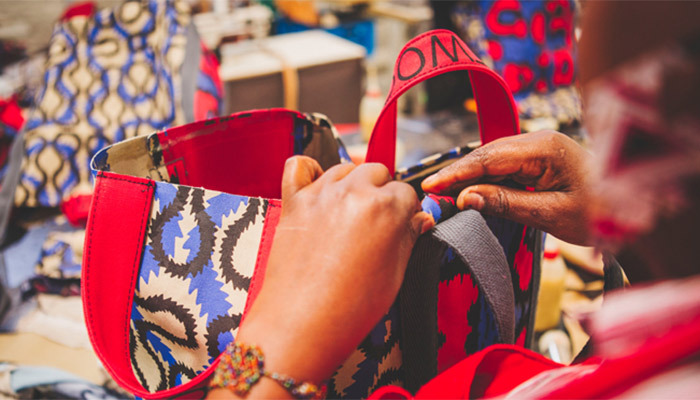 One of the many success stories the initiative can point to is the ‘Handmade with Love’ bags Westwood has produced since the beginning of the decade in Nairobi, Kenya. 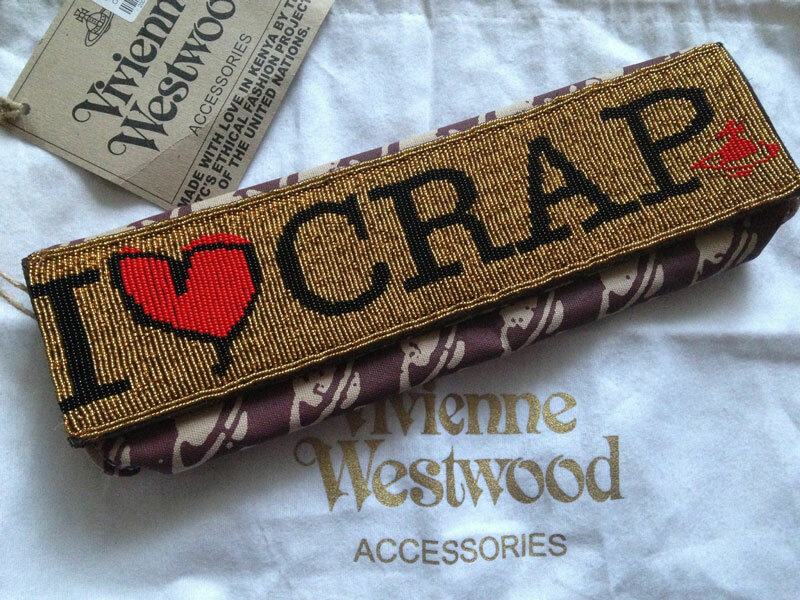 With the practical support and continuing orders from Westwood this arrangement was re-launched in 2015 as a completely private business supplying Vivienne Westwood with a range of high-end accessories. What’s so significant about this is that the arrangement has led to a new and sustainable method of wealth creation in a developing area of the world. This means there’s now the ability to grow a new industry and develop the associated infrastructure that revolves around a new and highly skilled sector. It also means the opportunity for native born Kenyans to pass down sought after skills to the next generation to foster long-term wealth generation for ordinary families, communities and, eventually, the entire Kenyan economy. The 2018 A/W accessories collection for Westwood alone has impressive figures to shout about: 62% of the workforce were women, 64% of the workforce used their earnings to pay for school fees while 82% overall invested their earnings in health, education and/or starting small businesses. Perhaps best of all, almost everything is being built on the use of recycled canvas, reused roadside banners, unused leather cut-offs and recycled brass. It’s amazing what can be done when you’re in the position to forget about your political leaders and just take action. Shell actually scrapped their plans for the Artic amid what they said were a number of other factors that would have affected their bottom line, but the timing points to the pressure they were under from activist groups to make a quick and public decision. Yet this is still a battle being fought on a number of different fronts. Despite Westwood’s impassioned plea, and the host of influential people lending their names to the effort at the time, it was just last month that the Guardian was reporting on the continuing depletion of Artic ice due to climate change. This could eventually lead to another literal ‘cold war’ as land bridges and shipping lanes become traversable again and old military war bases are re-opened in anticipation of land-grab conflicts. When national governments see potentially catastrophic changes in the global landscape as one-dimensional geopolitical opportunities you begin to understand just how important voices like Vivienne Westwood’s are. 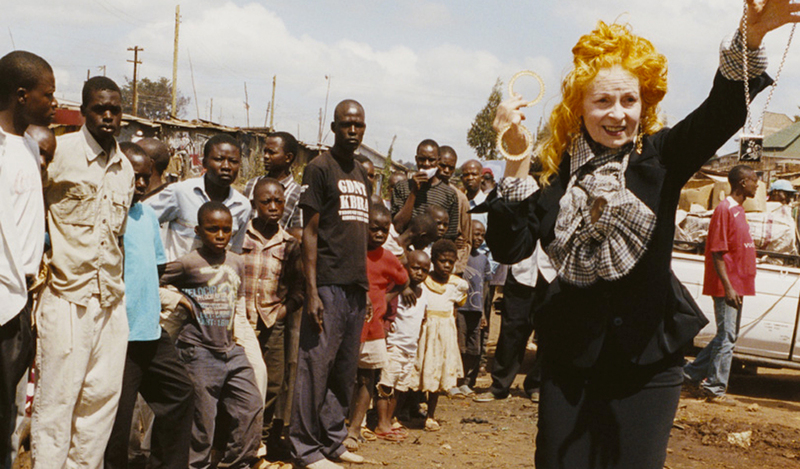 Out of all the many initiatives Vivienne Westwood (the designer and the fashion house) has been a part of over the many years perhaps one of the more overlooked moments came 12 years ago when she published her somewhat irreverent manifesto, Active Resistance to Propaganda. One of the central tenets to the manifesto was ‘culture is the antidote to propaganda’. Given the success she’s had in combatting the propaganda on climate and the environment from elected leaders and their industry donors around the world it would be very hard to argue that she hasn’t already proved her theory. Hopefully it won’t prove to be too late. For more on Vivienne Westwood click here. To read part II of our Sustainable series click HERE.